So I wrote one more post this week than last. That's ok, I'll take it. I did take my lunch to work every day and I'm sticking to my budget so far. Monday -- Pinto beans and rice, Fuji apple and red grapes. Tuesday -- Pinto beans and rice, Fuji apple, red grapes. Wednesday -- Senegalese lemon chicken and brown rice (did I forgot to point you to this post I wrote this past Friday for Fitfare for this recipe? It's really really good and I'm going to make it lots), summer squash, apple, red grapes. Thursday -- Turkish Eggplant and Tofu Curry, summer squash, and red grapes. Friday -- Pinto beans, summer squash, Fuji apple, and red grapes. I'm eating lots of red grapes because they're in season right now and it does't last long. They're really good with oatmeal in the morning instead of raisins and they're super sweet right now. 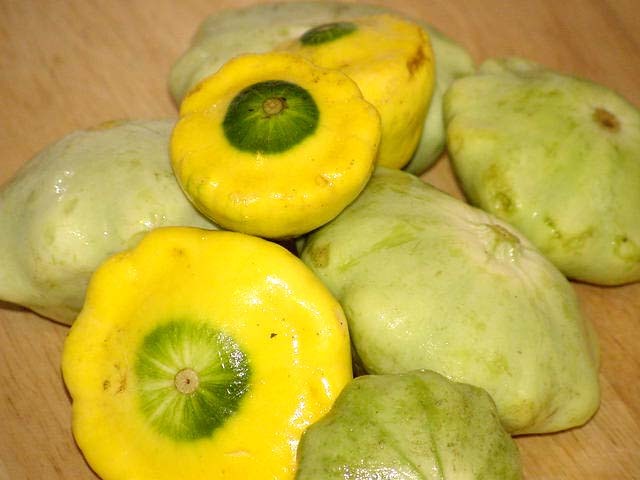 Here's the patty-pan summer squash I had for lunch almost every day. I just steamed them and ate them plain. They were much bigger than I usually get, but they were full of flavor. I just got back from the grocery store with lots of goodies. I didn't go to the Green Market yesterday because the Air and Water Show is in town and I didn't want to fight the crowds around Lincoln Park. Later today I'm going to make a Mediterranean Lentil and Couscous Salad to write up for Fitfare next weekend. Then I'm going to cook up some green beans and broccoli with basil to take for lunch.